We teach your employees to recognize bait and traps commonly found in phishing emails and spear phishing attacks. Users will learn to identify and avoid manipulative content, malicious and disguised links, dangerous attachments, inappropriate data requests, and other threats. We offer two styles of education on this subject, an interactive training module and a character-driven training game. 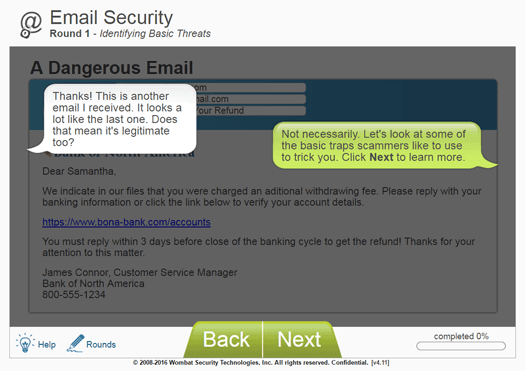 Both present examples of phishing emails and ask users to identify potential traps.